Christians paid final respects on Sunday to Pope Shenouda III, who spent the last months of his four decades at the head of Egypt's Orthodox Church trying to soothe sectarian tensions that have escalated since the ouster of President Hosni Mubarak. Ten of thousands lined up at the cathedral where Shenouda's body was initially laid in a coffin and later seated on a ceremonial throne wearing gold and red embroidered religious vestments, a golden mitre on his head and holding a gold-topped staff. The lines blocked traffic in central Cairo and some women and elderly fainted in the heat. The cathedral opened and closed its doors several times in an attempt to contain the crowds. Two people were killed in the crowding, medical sources said. One suffered a heart attack and the other, an elderly citizen, died of exhaustion. Mubarak, who suppressed Islamists, was ousted last year. 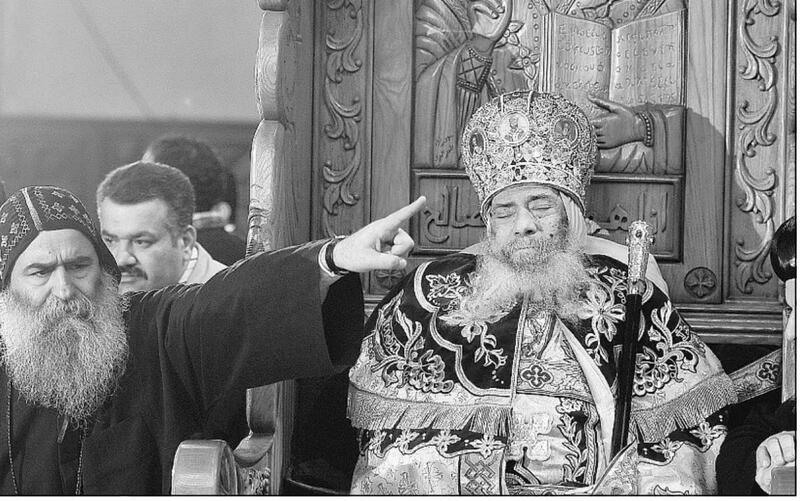 Since then Shenouda, who died on Saturday aged 88, often called for harmony and regularly met Muslim and other leaders. Christians, who comprise about a 10th of Egypt's 80 million people, have long complained of discrimination and in the past year stepped up protests, which included calls for new rules that would make it as easy to build a church as a mosque. Christians have accused hardline Islamists of attacking churches and said the authorities have failed to step in to protect them, although experts say some recent incidents have been fuelled by local grudges as well as sectarian tensions. Shenouda had served as the 117th Pope of Alexandria since November 1971, leading the Orthodox community who make up most of Egypt's Christians. His funeral will be held on Tuesday, Egyptian state media reported. Interim military rulers paid tribute to the church, visiting the grounds of the Orthodox Coptic Cathedral in Cairo. Field Marshal Mohamed Hussein Tantawi who Mubarak handed power to promised to airlift Shenouda's body to where he will be buried. U.S. President Barack Obama offered his condolences and Pope Benedict, leader of the world's Roman Catholics, offered prayers after being informed of his death. "I would like to express to the members of the Holy Synod, to the priests and to the faithful of the Patriarchy, my strongest feelings of fraternal compassion," said Pope Benedict. Describing Shenouda as a longtime advocate of unity among Christians, he said the Catholic Church "shares the pain afflicting Orthodox Copts." Shenouda was popular among many of Egypt's Christians even outside the Orthodox Church, as well as among many Muslims.